← The little film that could… and then couldn’t stop. On March 2, 1955 a young black resident of Montgomery, Alabama got on a bus and refused to move to allow a white woman to sit down when no more ‘white seats’ were free. She was spending a lot of time learning about the civil rights movement and it must have been from there that she summoned the strength to say out loud on that bus with enough white people to take up all the ‘white seats’ that “it’s my constitutional right” to stay seated. She continued to shout the same thing as she was handcuffed, arrested, and forcibly removed from the bus. Three other women had the same experience that year. The fourth one, on December 1st, was Rosa Parks. And yet the name Rosa Parks is probably more familiar to most people than that of the first person from March, Claudette Colvin. In fact, another bus incident isn’t even something people usually know about, much less the four other incidents before Ms. Parks’. Why don’t we talk about Claudette Colvin? Rosa Parks was a woman in her 40s, a seamstress, and had the appearance of a middle-class person. Claudette Colvin was 15, unmarried and pregnant. In the end, while building a case against bus segregation, the NAACP and other organisations they were working with felt Parks was a better face for the cause ignoring entirely Colvin’s heroic first act. For her bold and daring actions standing for the rights her country claimed to empower her with, Ms. Colvin, clearly a remarkable child, was convicted in juvenile court for disturbing the peace on the bus where she defended those rights. There is nothing unheroic about Ms. Parks’ actions. She, along with several others, helped hold a microphone up to the muffled whispers of people suffering in silence. But in a world where we often champion the pioneer and the ground breaker, Ms. Colvin’s omission from our collective consciousness seems an unjust and insulting tribute. 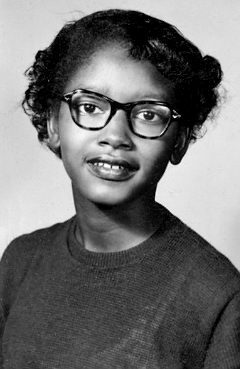 Claudette Colvin, at age 15, around the same time as her arrest. Thank you so very much, it is my first time meeting Ms. Colvin. A quick search left me amazed at how long I was ignorant of this lady’s action. @Noirfifre – I think most people would be amazed if they found out. Glad to tell more people a story that I think needs to be told more often. No statue, no commemorative medal, but it doesn’t mean others can’t share the story. Exactly, it is part of the history of actions against Jim Crow Laws. I guess this is one of the reasons many consider the writing of past events as subjective. I have done a few basic reading of Ms. Colvin and sharing her story. Did anyone but me know about Claudette Colvin?